Craftsman 11 pc. 6 pt. Standard 1/4 in. Socket Wrench Set Only $9.99! (Reg. $20)! You are here: Home / Great Deals / Amazon Deals / Craftsman 11 pc. 6 pt. Standard 1/4 in. Socket Wrench Set Only $9.99! (Reg. $20)! The Craftsman 11 pc 1/4 in Standard Socket Wrench Set includes a 1/4 inch drive ratchet with a 1-1/2 inch extension bar and nine different standard sized sockets (3/16, 7/32, 1/4, 9/32, 5/16, 11/32, 3/8, 7/16, and 1/2 inch). 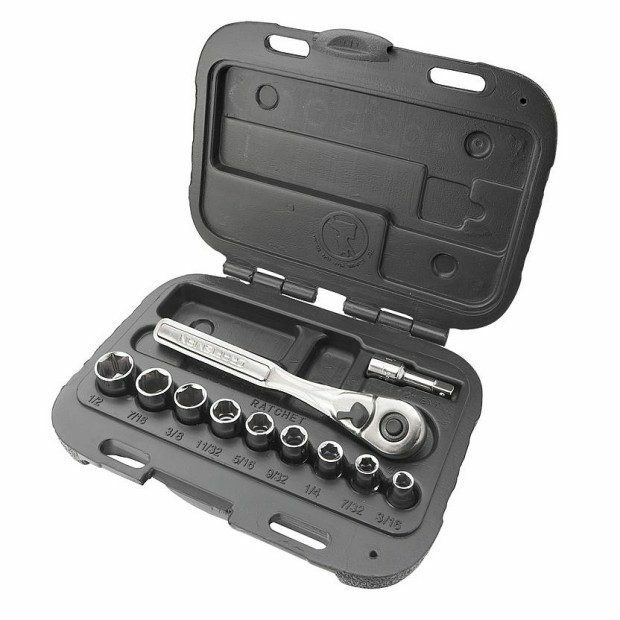 Wrench set is stored in a durable black plastic carrying case, which keeps your tools organized and easily accessible-each socket spot is clearly marked on the case, so you know exactly where each one belongs. Great to use on cars, lawn equipment, or even putting together furniture. Your tool collection won’t be complete without this standard wrench set. Comes with a Craftsman Warranty.